← Has Probation a future? In episode two Robert Kee adroitly negotiates his way through a myriad of propaganda while separating myth from reality. This episode explains why modern Ireland became such a troubled and polarised nation. He does not pull his punches; atrocities are graphically outlined, making for uncomfortable viewing. Kee begins with the `Flight of the Earls` September 1607, when Hugh O`Neill and his entourage went into self imposed exile. O`Neill the last Gaelic/Catholic leader in Ireland, had after his rebellion with England, lost all authority in his own country. We are reminded that O`Neill was made an Earl by the English Crown, an example of what eminent Irish historian RF Foster calls “the Janus-face of Ireland”. When O`Neill departs, the enormous area of land under his possession in Ulster (hitherto the most Gaelic/Catholic region) was grabbed and forfeited to the English Crown. Donegal, Tyrone, Fermanagh, Cavan and Armagh colonised or planted with largely Scottish settlers. Plantations had occurred in other parts of Ireland but this was the most successful because of its geographical proximity to Britain. The job of colonising Ireland Kee informs us was given to `THE HONOURABLE – THE IRISH SOCIETY` a body operating in much the same way as the East India Company. The City of London was in the driving seat, charged with settling the North. It promptly renamed Derry – Londonderry. The land grab resulted in 10% of Ulster remaining in the native Irish populations hands – “who had once had all of it”. The Crown facilitated this, while extracting higher rents from the native population double that charged the newly arrived settlers; the latter occupied the most fertile territory. Kee points out that a significant percentage of the native population remained in occupancy, an unfortunate development as far as the planners of this scheme were concerned – they were required as tenants and for labour. The plantation of Ireland was not a Carthaginian arrangement, as we have seen the native population hung on, while resentment against the settlers grew and festered. The most successfully planted population arrived from Scotland, Protestants from a dissenter tradition and as Scottish Presbyterians subject to religious discrimination. The Episcopalians or Anglicans held the whip hand. This anomaly becoming an important feature later; the first Irish Republicans were Protestant. On the 23October 1641 the Gaelic/Catholic Irish rebelled, an event outlined by Kee in terrible detail, especially the horrific events at a bridge at Portadown. Where many women and children were drowned or shot. As Kee points out some of the rebels rowed out hitting those struggling in the water, sending them to their death in barbaric fashion. The event adorns many Orange Lodge Banners, a terrible occasion given added currency because as Kee points out, a woman a ghostly apparition is said to have walked from the water crying out “revenge, revenge”. Robert Kee dissects the Rebellion with reference to a set of documents, which he explains are controversial, called the `Depositions`. He wrestles facts from propaganda some estimated that the rebels killed 130,000 Protestants, impossible Kee says because this was the entire Protestant population! Kee explains that without doubt terrible atrocities took place during this rebellion. It may not have been systematic or organised but when one is victim of an atrocity the context, as Kee sagely explains, is unimportant. During this sequence an Orange Parade circa 1980 is broadcast. A man wearing a Sash gives Kee an explanation about the massacre at Portadown. Explaining it happened because Catholics were stopping Protestants “reading the holy bible”. Kee points out that there was a sectarian aspect to this event but religion alone fails to explain it. The individual giving this information exhibited no awareness of the religious discrimination that Protestants were heaping onto Protestants at the time. Further, the rebels in 1641 were loyal to the English Crown (Pro Deo, Pro Rege, Pro Hibernia Unanimis) but rebelled to get back their land and what distinguished one group from the other was religion. There was another important section of society in Ireland at the time, the Old English settlers, also Catholic. As England descended into Civil War, the rise of the Puritans Kee explains, saw the Old English make common cause (the Confederation of Kilkenny) with the Gaelic/Catholic Irish. Again fear over a loss of land rights by virtue of religion was behind this pan-Catholic response. Which leads us to Cromwell, a name scorned even today in Ireland – both the siege of Drogheda of 1649 and Wexford are described again in grim detail. 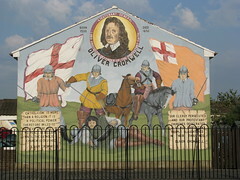 The event is often described as an attempt by Cromwell to ethnically cleanse the Irish. But as Kee points out the garrison in Drogheda was defended by English Royalists and they were butchered along with everyone else who got in Cromwell`s way. Yet again the viewer is given the details of the massacre; those that were not killed were sent as forced labour to the West Indies. Cromwell may have been motivated by religious zeal (and a misguided attempt to revenge those slain in 1641) but he wanted the spoils of war, land. He removed the native population from it, famously advising them to go to “hell or Connaught.” By 1714 Robert Kee states Catholic land ownership amounted to a mere 7%. The Restoration of Charles II in 1660 saw little change (although the persecution associated with Cromwell abated) but in 1685 his brother the Duke of York, James II a Roman Catholic replaced him. Ireland became the battle ground between James II and William of Orange, who set about wrestling the Crown from James in the Glorious Revolution of 1688. Kee outlines the significance of the Apprentice Boys who fearing that the Catholics were about to repeat the events of 1641, slammed shut the gates of Derry in the face of the rightful heir King James II. The siege and its significance are outlined by Kee, leading to the symbolic utterance of `No Surrender` which Kee explains is yet again more myth making. Those starving behind the Walls of Derry were preparing to surrender, but in Ireland perception is at times more significant than reality. The episode closes with King Williams’s victory on June 14 1690 at the Battle of the Boyne and of course in 1691 `Aughrim was lost`. Kee covers the triumph of Orange over Green with contemporary film of people replaying key events for propaganda rather than historical purpose.